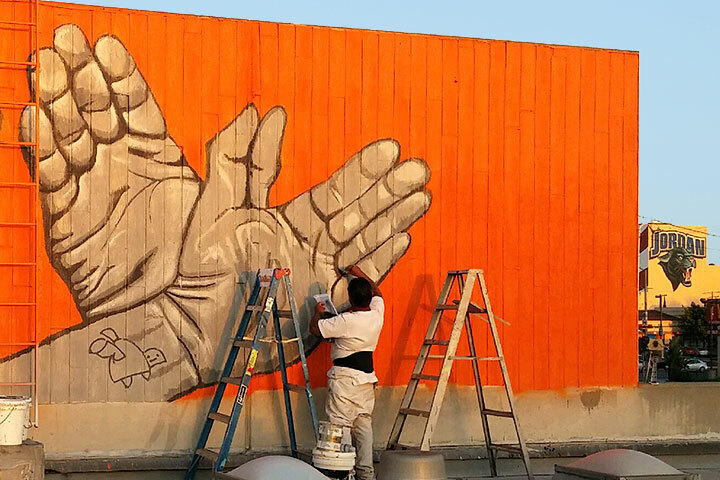 Students from Jordan Plus High School have worked closely with local artist Guillermo Avalos and art teacher Reba Castaneda to paint a large mural near Artesia Boulevard and Atlantic Avenue behind the Golden State Humane Society. The project is part of Long Beach’s Creative Corridor challenge set forth by City Councilman Rex Richardson. The challenge is an initiative to change spaces in the community, beautify open, unused areas, and create destinations that have a positive impact on the community. Students worked on the project on Saturdays and on weekdays after school. Casteneda was a Jordan High School student when she first met artist Avalos through a mural and cultural arts program in Long Beach ten years ago. PUBLIC MURAL – Students from Jordan Plus High School worked with their art teacher and a local artist to create a large mural near Artesia Boulevard and Atlantic Avenue. The school partnered with the City of Long Beach on the project.